It never ceases to amaze us that what is essentially a species of really successful primates is able to launch a rocket into space, have it travel around 350 million miles and land on Mars, pretty much right where it wants it. The logistics, engineering, science and all around awesomeness required to do this is just mind boggling. Even more amazing is that the descent of this rover on an otherworldly land is then captured in images by a satellite this same species of primates placed there a few years prior! 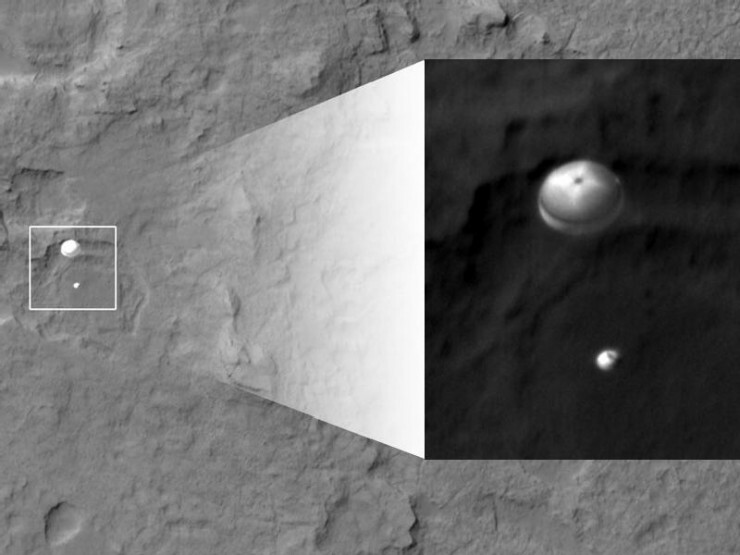 The above picture, in case you haven’t seen it yet, is just that: NASA’s Curiosity rover descending towards Mars’ surface as captured by the Mars Reconnaissance Orbiter, which has been orbiting the red planet since 2006. The touchdown, as you surely know, was flawless; news of this has been pretty hard to miss. But there are two (pretty geeky) factoids about the mission you may not have heard in the media yet: what’s Curiosity’s brain and what does it have to do with Apple, and what’s the image file type it’s transmitting in? For the answer to these questions, hit the jump. By David Ponce on 05/24/12 • Leave a comment! The top photo was taken with NASA’s Terra satellite with its Moderate Resolution Imaging Spectroradiometer. No points for guessing in which part of that shadow was the eclipse most complete. 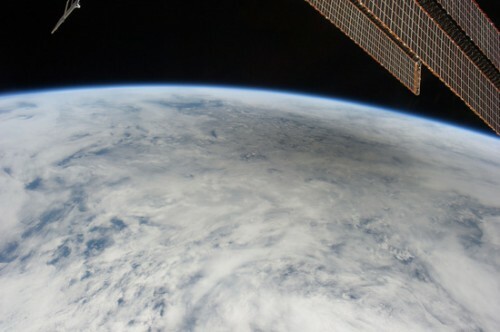 The second photo is taken from the International Space Station by noted shutterbug Don Pettit. 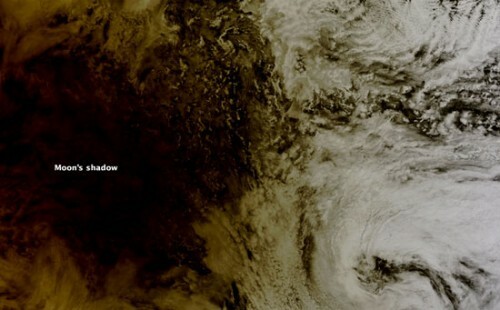 This shadow is a little bit harder to discern, but it does give you a better idea of the scale of it against the globe. Last weekend’s eclipse was the annular kind, which leaves about 6% of the sun exposed as a fiery ring around the moon. If you just look around the inter tubes a little bit, you’ll be sure to find pictures of that. But we just thought it was interesting that while most pictures involved cameras pointed up, these two above involves cameras pointed down. We’re all sad that the shuttle program is over. Space exploration is just no longer the cool thing it was; government dollars for NASA have been dwindling for years. This shifting of priorities is due to the fact that we’re no longer “at war” with the USSR. 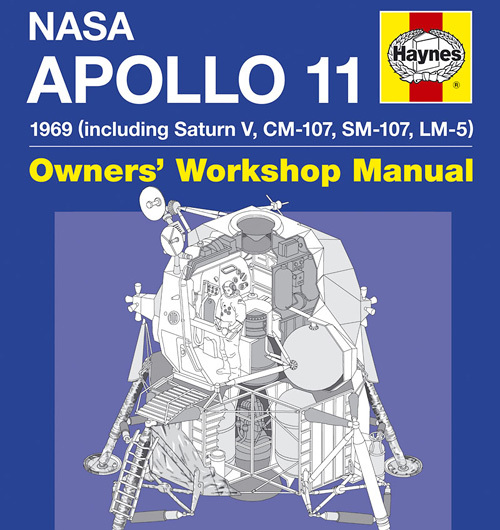 The cold war meant that each power had to constantly outdo the other and the race into space was as good a way as any to try and one-up your adversary. But all that’s a distant past. So, to relive some of the memories, maybe you could watch the above video. It’s a fascinating 400 second journey of a couple of cameras strapped to the side of the booster rockets on Atlantis and Endeavour. They reach speeds of 3,000pmh and 41 miles of height before noisily re-entering the atmosphere and splashing down in the ocean. It’s all caught in multiple angles and is well worth the watch. 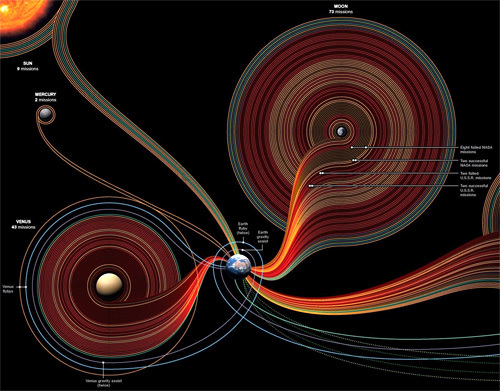 Created by Sean McNaughton and Samuel Velasco for National Geographic, this beautifully illustrated map includes the almost 200 missions to space from the past 50 years, showing which of our celestial neighbors we like to visit the most. The National Geographic website has an interactive version you can pan and zoom around on, but if you’d like to make yourself a nice little wallpaper you can find a full-sized version of it on Flickr. By Jonathan Kimak on 08/05/08 • Leave a comment! A new study by NASA’s Jet Propulsion Laboratory in Pasadena, California, reports that asteroids headed for earth could be deflected by the weak gravitational pull caused by the engines of a nearby spacecraft. 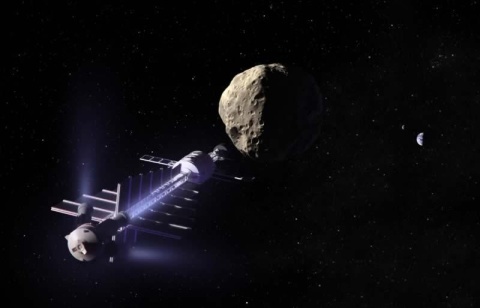 The hypothetical spacecraft, known as a gravity tractor, would be able to deflect asteroids as large as 140 metres in length. The tractor would position itself along an asteroids path at an optimal location to deflect the asteroid away from earth’s atmosphere. The study reaffirms previous research into the field of gravity tractors and adds an engineering framework that brings the tractor from being theoretical into something that really could be created. It should only be a matter of time before we go from gravity tractors to tractor beams.